Opis: What size particles compose Saturn's rings? To help find out, the robot Cassini spacecraft now orbiting Saturn broadcast radio waves of three different wavelengths right through the rings to Earth earlier this month. The experiment was sensitive to ring particle sizes because ring particles much larger than a broadcast radio wavelength will reflect those radio waves away. Three different wavelengths were used: approximately 1 centimeter, 3.5 centimeters, and 13 centimeters. The results are coded into the above false-color digitally reconstructed image. In the above image, the color purple indicates regions populated predominantly by ring particles larger than 5 centimeters, while the color green indicates regions with a significant population of small ring particles less than even 1 centimeter. The white center of Saturn's B-ring indicates that the density of ring particles was too high to make a good determination. Other radio observations indicate that some ring particles can be as large as several meters across. 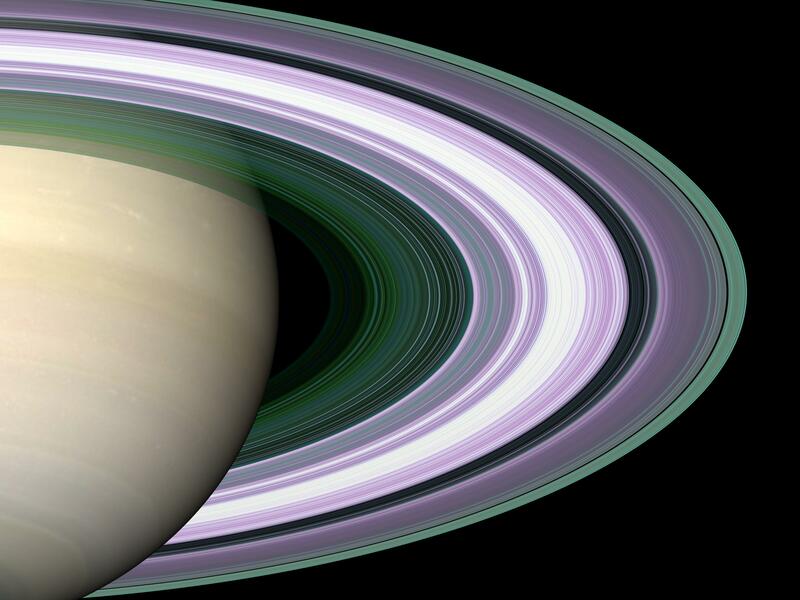 The impressive nature and clarity of the above sharp image may help determine clues about the origin of Saturn's beautiful but enigmatic ring system.